An ongoing debate about the true vision of Pakistan's founder flares up every year around Quaid-e-Azam's Birthday that coincides this year with Eid Milad-un-Nabi, the birthday of Prophet Muhammad (PBUH). This debate is centered on one key question: Did the Quaid want an Islamic state or a secular state or a pluralistic democratic one? The growing intolerance in Modi's India and the Indian government commission headed by former Indian Chief Justice Rajendar Sachar confirm that Muslims are the new untouchables in caste-ridden and communal India. Indian Muslims suffer heavy discrimination in almost every field from education and housing to jobs. Their incarceration rates are also much higher than their Hindu counterparts. Direct Action Day clearly proved that MAJ was as much a peace loving muslim as there are black santa claus. Only Pakis will glorify him. it is an apt justice that Shias are getting murdered in Pak. What inspiration did he draw from Prophet's genocide of entire Jewish tribe of banu Qurayza. A valuable contribution from you Riaz. It is very brief but conclusive. I have not seen such an analysis taking into consideration the Misaq-e-Madina and trying to prove that in fact the two views are not poles apart but in fact are supportive of each other.Yes the post partition era ,specially the existing one ,has proved the validity of the two nation theory. Thanks for enlightening on all these facts. Anon: "Direct Action Day clearly proved that MAJ was as much a peace loving muslim as there are black santa claus. Only Pakis will glorify him. it is an apt justice that Shias are getting murdered in Pak." "And all over the country, actually, there were - there were meetings held on this day, and there was no violence whatsoever. There were just political speeches given, and Jinnah himself very clearly said that's all he wanted. He wanted his followers to go out and make the case for Pakistan, and that's all. But in Kolkata, which was a very turbulent city, there was - you know, it's a great industrial center. It had been bombed during World War II. People were still semi-traumatized from their experience during the war and at the famine that occurred during the war. And there were lots of leftover weapons lying around that Americans had - soldiers had left behind huge cases of ammunition, so it was a tinderbox. And on that day, the speeches that were given were fairly inflammatory. And some of the Muslim listeners to these speeches went out and started burning and looting in Hindu areas. At the same time, Hindus in different parts of the city were also sort of throwing bricks and stones at Muslim marchers, so it's unclear - it's very hard say exactly how it started or who started it." Anon: "What inspiration did he draw from Prophet's genocide of entire Jewish tribe of banu Qurayza. " He understood that that "No Jew shall be killed for being Jew" as agreed in the Misaq after the Battle of the Trench in which the Jewish tribe betrayed the citizens of Madina. 12 If they refuse to make peace and they engage you in battle, lay siege to that city. 13 When the LORD your God delivers it into your hand, put to the sword all the men in it. 14 As for the women, the children, the livestock and everything else in the city, you may take these as plunder for yourselves. And you may use the plunder the LORD your God gives you from your enemies. I wonder how much better Hindus, Ahmadiyya Muslims or Shia Muslims fare in Pakistan compared to Muslims in India. You don`t need to worry about us, the condition of Pakistan's minorities is far better than that of Indian`s. We don`t kill people for eating beef, in India despite the increase in Muslim population their representation in Lok Sabha has been on the decrease from the 1980s on the other hand Pakistan has a fixed quota reserved for its minorites. @Mr Riaz why do you even allow their bigoted comments to be published? In India we have a separate law for recognizing Muslim marriages. "in India despite the increase in Muslim population their representation in Lok Sabha has been on the decrease from the 1980s on the other hand Pakistan has a fixed quota reserved for its minorites." Sure! Sure! Come back and awaken me when you have a non muslim President/Prime minister/Army General/Cabinet Ministers. In india we had many non hindu/minority prime ministers, presidents and cabinet level ministers. Lets face it! No country which bases itself on religious grounds can ever be conducive for minorities. Till this date no country had ever been no one is going to be in the future. All the civilized world have long separated their church and state. It is high time Pakistan also does that. Perched above the press seating area inside the U.S. Supreme Court chamber is a marble image of Prophet Muhammad. Sculpted in a frieze, the Muhammad statue carries a sword and the Quran and stands in the company of more than a dozen other “great lawgivers of history.” They range from Moses to Confucius to Napoleon to John Marshall, some of whom appear in an accompanying frieze along the south side of the room. In a week in which the right to mock – or even depict the Prophet Muhammad – became the focus of world-wide debate, the Supreme Court sculpture of the prophet of Islam has drawn little notice. That wasn’t always the case. Back in the 1990s, a controversy erupted that culminated with calls by some Islamic leaders to sandblast the statue’s face off the chamber wall. Islam strongly discourages depictions of Muhammad. And in 1997, some Muslim leaders called on the Supreme Court to remove the image inside the chamber. The “controversy was generally laid to rest, in part through a fatwa” authored by Sheikh Taha Jaber al-Alwani, an influential Islamic scholar, according to a 2009 article in Hamline University’s Journal of Law and Religion. Nihad Awad, the executive director of the Council on American-Islamic Relations, told Law Blog on Wednesday that he now considers the matter closed. 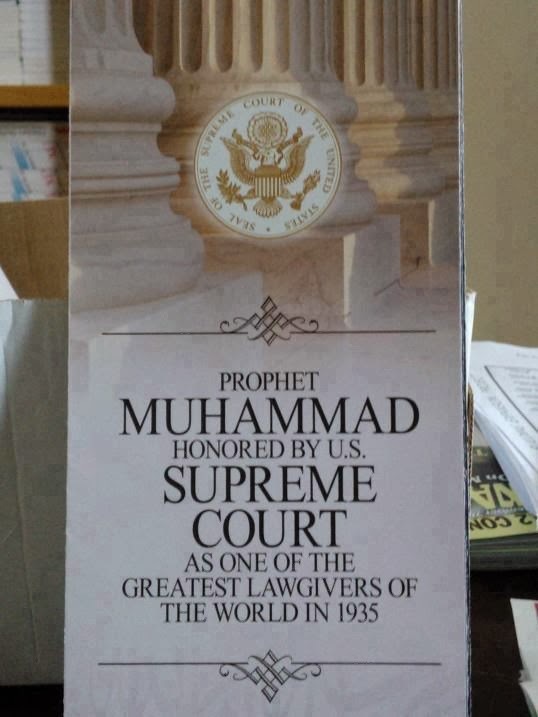 While his group’s demands weren’t met back then, he said he gives the late chief justice credit for agreeing to correct a Supreme Court brochure that had misidentified Muhammad as the “founder of Islam” rather than a prophet.